At the end of 2017, construction and services specialist Procare delivered a new operating theatre. MBS looks at the challenges of designing and installing cooling and other services in this challenging environment. In October 2017, Procare completed delivery of a new operating theatre at Ramsay Healthcare’s Rivers Hospital in Sawbridgeworth, Hertfordshire. Rivers is a private hospital, serving patients in London and the Home Counties, and has been named one of the top healthcare employers in the UK. Following continued growth, they required a fifth operating theatre to increase capacity and meet demand for patient care. Procare won a competitive tender with a cost-effective proposal demonstrating experience of delivering similar healthcare construction projects. Rivers had developed an innovative design aimed at moving patients through the preparation room, into surgery and on into the recovery room as efficiently and cost-effectively as possible, ensuring patients had a seamless experience and medical staff used time effectively. 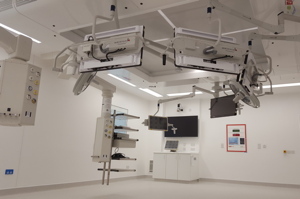 Within this design, they wanted a custom-built theatre which takes advantage of the latest clinical technology, with high definition monitors and cameras suspended from the ceiling on movable arms, allowing medical staff to move around patients and access information more easily whilst making it easier to maintain high standards of cleanliness. A purpose-built ventilation system was required to ensure a sterile environment in the operating theatre. This is all needed to meet exacting hospital standards which support an environment where critical clinical procedures are carried out on a daily basis. All this had to be delivered within a working hospital environment with minimal disruption to existing patients. Cook says: “This was a live hospital, so the project needed to be delivered by people with an indepth understanding of hospital needs, both in terms of how the infrastructure will be used and how to ensure day-to-day operations can continue without disruption or risk. Procare managed the delivery of the new building, including engaging specialists to design the mechanical and electrical systems to ensure the hospital functioned safely and efficiently, whilst ensuring construction works did not disrupt the hospital services. The seven-figure project, delivered over 52 weeks, required excavation and formation of a basement plant room and construction of a single-storey building which housed the reception, surgical preparation room, high tech operating theatre and recovery rooms. The project also involved development of existing facilities to make best use of the new operating theatre, including widening an anaesthetic room, full refurbishment of the day care area, and creating new recovery and preparation rooms and a new reception area. Life-critical systems such as including medical gas systems, nurse call systems, monitoring systems and displays – plus operating-room technologies - all had to be cabled and installed. This process went beyond simple wiring, it was critical that these systems were correctly set up and connected to backup power. 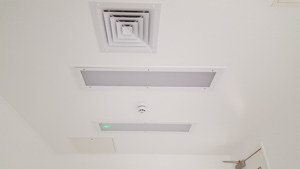 Ventilation systems were installed to ensure the operating theatre met British and European standards for indoor air filtration. These apply throughout the building but must be of particularly high standards in the operating theatre where a sterile environment, with negative air pressure, is required to control risk of surgical infections. Successfully delivering a ventilation system to meet standards throughout the building is a complex process, requiring lots of moving parts at different levels of multiple systems, all working correctly together. Rigorous electrical testing was performed to ensure safety in use. Rivers has expanded over time, adding and updating technology, which can mean there are different M&E systems designed at different times for different purposes in the building. Testing of new systems is vital to ensure they are properly integrated with existing system and that there is no risk that critical systems will be shut down accidentally. The team was led by Steve Cook and the project overseen by a Procare contract manager with experience of similar hospital construction. It was delivered by on-site staff management and subcontractors with equally broad experience of healthcare projects. Procare has a network of highly skilled professional contractors whom it works with regularly, to allow it to deliver wide ranging complex projects. For Rivers, specialist M&E contractors were engaged with experience in meeting hospital regulations. Procare managed mechanical systems contractors to deliver the ventilation system and medical gas delivery, as well as fundamental operational systems such hot and cold water supplies. Electrical contractors were brought in to install nurse stations, call systems, and lighting, all whilst ensuring the highest standards were delivered in safety critical aspects of the project. Throughout the project, liaison with clinical and facilities staff was key to understanding the hospital needs. This ensured the project delivered was not only fit for purpose, but also that the needs of the ongoing business of the hospital were considered during construction. Steve Cook concludes: “Not all buildings are equal, and projects like this need construction and M&E expertise which understands the context in which it is being delivered.